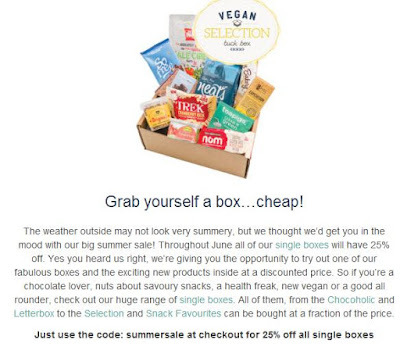 The Vegan Magpie: Vegan Tuck Box summer sale! Hello! The deliciously tempting Vegan Tuck Box have a summer sale on all of their single boxes! You can get 25% off when you add a single box to your basket and add the code summersale when you checkout. 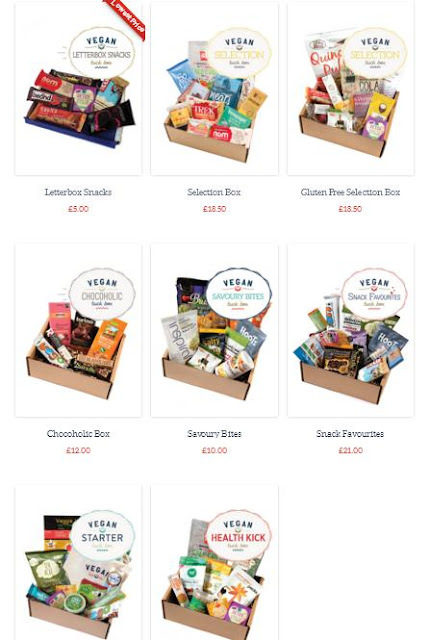 Just go here: https://vegantuckbox.co.uk/product-category/single-boxes/ and choose your preferred single box, then add your discount code at the checkout. This goes for all of their single boxes, I've taken a little screenshot of them all below. My favourite is the 'snacks favourites' box as you get a mix of sweet and savoury, but you can click on each box and find out what you get inside each one to find the best for you! You can also add extra items to your order from the tuck shop. You have to pay for shipping, but depending on your shipping cost (£3.50 under £25, £4.50 over £25) and the box you choose, the discount can save you the shipping cost plus a little more (such as with the snack box).